It is a large capacity backpack. This backpack has many pockets & features. This is made with high quality tear and water resistant material, provides extra strength and long-lasting performance with the lightest weight possible. The length of the shoulder straps is adjustable. Built-in severe quality controlled USB charging port , easy to charge Smart phone without hassle to take out power bank . Also it has headphone jack. 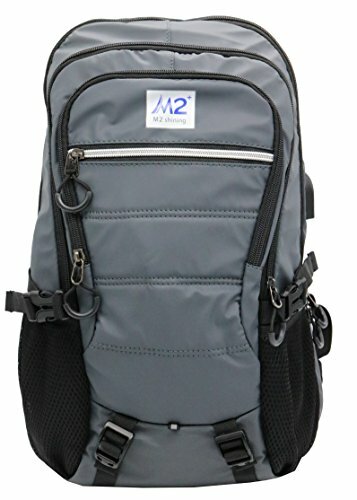 This backpack features one main zipped compartment, one zipped front pockets and two side pockets. Has pocket for laptop that built-in cushion and pocket with stopper so it will protect laptop from shocks ! Great for hiking, travel, camping & as carry on luggage and also School camping for children, and perfect for disasters and others. It's a simple design, Good for men and women. If you have any questions about this product by M2s⁺, contact us by completing and submitting the form below. If you are looking for a specif part number, please include it with your message.